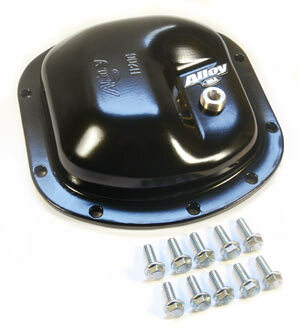 Corona, CA –Alloy USA's newest accessory now includes their line of Heavy-Duty Stamped Steel Differential Covers. Crafted from 1018 steel, these differential covers are designed to handle the punishment that drivers are dishing out on their vehicles. Stock differential covers are designed primarily as an oil containment system. That is most covers were designed just to hold back the oil and not for track or off-road abuse. Most engineers never dreamed that their differentials would be running up rock faces, scraping boulders and fending off tree stumps. Because of these stresses we've designed our diff covers tougher than stock to handle the abuses. These covers are 1018 steel which is tough enough to protect from scrapes and bumps but pliable enough that they don't shatter under high stress like some aluminum covers. These covers also increase ring and pinion gear life with less added stress and flex. These are direct OEM-spec replacements fitting the stock differentials with zero modifications. Installation is easy with longer differential bolts and high-temp gasket sealant. Alloy USA is a manufacturer of performance drivetrain products, high-strength axle shafts and kits, performance ring & pinion sets and installation kits. They specialize in Jeeps, Chevy, Dodge and Ford muscle cars and trucks.